Sasha Banks makes her way to the ring with her newly won title belt. She feels like she’s on top of the world, but not too long ago she was in the top row of the crowd. Or watching from home where she dreamed about being as good as her heroes Eddie Guerrero and Trish Stratus. Her win is for all the people watching and dreaming. She also wants to make history again, so she challenges Charlotte to a match inside Hell in a Cell. Charlotte starts to head to the ring, but before she can get there Rusev and Lana come out and walk past her. He says that no one cares about the “stupid woman revolution.” Charlotte snatches the mic from his hand, tells him off, and agrees to Sasha’s challenge. Rusev takes the mic back and says it’s his ring. Sasha then snatches the mic and throws it down. Rusev isn’t happy. Lana picks up the mic and tells Sasha and Charlotte that they whine like little girls. Sasha and Charlotte attack both Lana and Rusev, knocking them both from the ring. Rusev gets back in, but before he can do anything Roman Reigns comes out. When Reigns enters the ring, Rusev leaves. Rusev and Lana walk away as Reigns stares Rusev down. New Day comes out, and Big E pulls handfuls of Booty-Os from his singlet to pass out to the crowd. Woods and Kingston look less than pleased about that. They talk about Cesaro and Sheamus. They don’t seem to like that Cesaro and Sheamus have a title shot, but they don’t seem too worried either. This was a fun match. 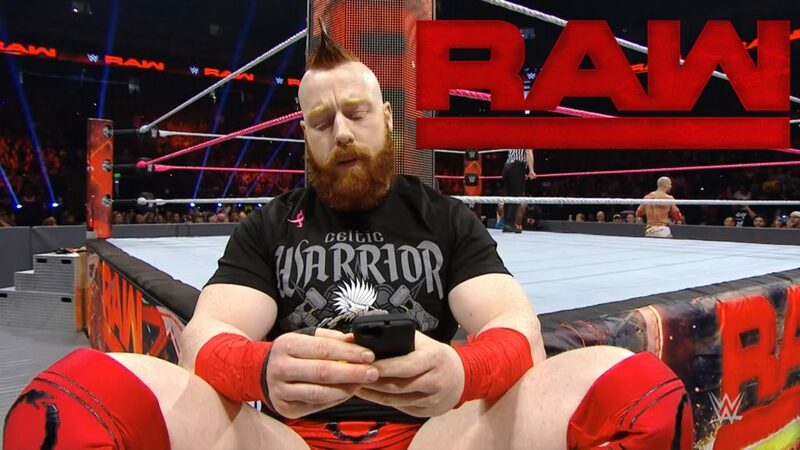 Sheamus spent most of the match on his phone at ringside which led to a nice moment when there was a face-off at ringside where Cesaro was wondering where his backup was. As far as wrestling goes, these two guys could have a way better match, but that wasn’t really the point. This was all about continuing to build interest in Cesaro and Sheamus, and it worked. This teaming is putting some much-needed personality back into Sheamus. From Off the Top Rope, Jonathan Coachman asks Golberg who he’d like to face in the ring. Goldberg talks about facing Goldberg, though he already beat him once. Kind of a squash match. It was okay for what it was, though Bayley missed a sunset flip at one point late in the match. After the match, Dana Brooke attacks Bayley from behind. Jericho talks on the phone when R-Truth walks by and interrupts. He tries to give Jericho a Payday candy bar. Good match. Sin Cara looked better than he has in a long time (at least, from the last time he was actually on TV). I liked the flow of the match too. Gulak and Nese dominated early and looked very good, but the teamwork of Dorado and Cara allowed them to creep into the match and take over towards the end. Stephanie McMahon compliments Mick Foley’s clothes and asks if she can join him for the next segment. Mick Foley and Stephanie McMahon are already in the ring. Stephanie introduces Foley and his fancy new suit. Foley then addresses Sasha’s challenge from earlier, saying that the Women’s Title match will indeed be inside a Hell in a Cell. He then says the Universal Title match will also be in a Cell. Owens and Jericho interrupt Stephanie as she starts to speak. Kevin Owens says Foley’s decision is stupid. Owens doesn’t want to be in a Hell in a Cell match because he wants to have a long career, unlike Foley. Jericho says that since Foley is just giving things away, he wants a private jet with “Team Chris and Kevin” written on the side. Owens agrees, a jet with “Team Kevin and Chris” would be great. Jericho accuses Foley of never liking him. He’s angry about Foley putting his best friend in a Hell in a Cell match, so Foley goes on the list. Again. Stephanie tells Jericho he should show Foley some respect. She also says that if Jericho beats Rollins tonight, then he should be added to the Universal Title match at Hell in a Cell. Foley agrees. Charly Caruso asks Rollins for his reaction to what just happened. He says it doesn’t matter, because regardless of the stipulation, he’s going to beat Jericho tonight. Bo Dallas and Curtis Axel are already in the ring for a match when Enzo Amore and Big Cass come out. As Enzo and Cass talk, Luke Gallows and Karl Anderson attack. They hit the Boot of Doom on Enzo and the Magic Killer on Cass. Dallas and Axel are in the ring, and Axel wonders if they’re still having a match. They get their answer when Sami Zayn comes out, followed by Neville. Interesting match. It was completely one-sided, and Bo never got tagged in. He just watched as Axel got beat up. Lana is upset with Charlotte, but Charlotte tells her to stay out of her way. Lana tells Charlotte to stay out of Rusev’s way. An okay match for what it was. There wasn’t a lot there to comment on really. TJ Perkins talks with Brian Kendrick. He says that Kendrick is acting like he is because he’s afraid that his career is almost over. He tries to get Kendrick to be the man that Perkins used to know, but Kendrick attacks Perkins instead. Perkins defends himself and seems more disappointed than angry. Bryon Saxton asks the Splash Brothers (Steven and Clay) about the next match. They say their mom always told them to go out and make a splash. They’re diving into the deep end tonight. A bigger squash than normal, but still a squash. Cole went nuts over Strowman hitting a “dropkick” on both of his opponents, but it wasn’t that impressive. He mostly just fell backward and extended his feet forward. Saxton starts to ask Strowman a question, but Strowman takes the mic away from him. Strowman isn’t pleased with his competition this week either. Reigns asks Banks if she’s ready for tonight. Banks is ready for Charlotte, so Reigns better be ready for Rusev. It was a pretty simple match, but I liked it. The champs looked very dominant, and the finish was a lot of fun. Tom Phillips asks Kevin Owens about the possibility of a triple threat. Jericho thinks Phillips’ question isn’t a question, and it’s stupid. Owens says it doesn’t matter. Owens also explains that he didn’t help Jericho last week because one member of the team has to remain strong. Paul Heyman is already in the ring. He introduces himself and shows a preview of WWE 2K17 that shows Brock Lesnar beating up Goldberg. He talks about all the people Goldberg beat in his career. It bothers Heyman that Goldberg is still one up on Lesnar. That being the case, he officially challenges Goldberg to a fight on behalf of his client. Premiering soon, the makeover of Emma to Emmalina. Good match. Daivari looked good, but Perkins looked better with his speed and fluid movements. I’d like to see more of Daivari though. Stephanie wishes Jericho luck in his match. Jericho thanks her, and tells her that she almost made it onto the list earlier tonight. She then tells Jericho that he’ll know what to do if he makes it into the triple threat match. Honoring Tito Santana for Hispanic Heritage Month. Good match. The match was very even, more even than I expected it to be. It actually seemed like Jericho could have won this one. I particularly liked Jericho’s focus on the ribs of Rollins throughout the match. It helped make the repeated attempts at the Walls of Jericho that much more effective. I liked the show. Good opening, good closer, and some nice matches in between. I’m not looking forward to Goldberg next week, but if that means we get to see Paul Heyman again then I suppose that’s a fair trade. There was a lot of good stuff on this show, more good than not so good, but this match was easily the best of the night. It seemed to have the most at stake as well, which probably helped it.